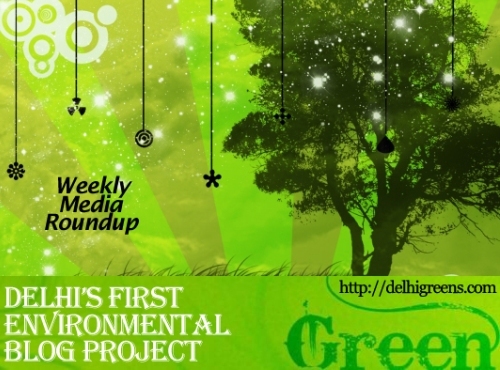 Weekly green news roundup from across different media networks for week 43 (between Oct 19 to 25) 2015. Winter is yet to set in but the city is already gasping for breath. In yet another damning indiction of air pollution in Delhi, a study has found that a student who travels from IIT Delhi till India Gate and back in various modes of transport, during rush hour, is exposed to 130-250 micrograms per cubic metre (µg/m3) of Particulate Matter (PM) 2.5 every month, according to a study conducted by IIT Delhi with other collaborators. Hoping to cover all the unauthorised colonies with piped water supply in the next two years, the Delhi Jal Board has laid down the network in 1,092 out of 1,658 colonies so far and in the last six months, it has been completed /notified in 70 new colonies. To ensure implementation of a comprehensive plan for prevention, control and abatement of air pollution, the Delhi government has made it mandatory for every petrol pump to have a Pollution Under Control centre. Delhi’s first car-free day hitched a ride on Dusshera holiday that saw a large number of vehicles staying off the road and the city, which has the dirtiest air in the world, recording a dramatic dip in pollution. The Delhi government, which built 85 per cent of the Signature Bridge across the Yamuna without the requisite environment clearance, has now missed a green court’s deadline to obtain at least a post-facto permission. Worse, a hurried move to obtain the nod even now seems set to threaten the river system. The Delhi government claims to have found a panacea to overcome the twin crises of depleting water resources, and unmanageable sewage-project ‘toilet to tap’. With sanitation workers staying away from work for the second consecutive day, many colonies in east Delhi virtually turned into garbage dumping sites on Saturday. A High Court bench has made Chetan Sanghi, secretary of the Public Works Department, the nodal officer to remove and prevent encroachments in forest areas of Delhi. In its first attempt to do away with multiplicity of authority in handling important projects, the AAP government has initiated the process to set up the Delhi Yamuna River Rejuvenation Authority Ltd. to ensure conservation, protection and rejuvenation of the Yamuna in the national capital. In an attempt to stop pollution of rivers and prevent further deterioration of surface water, groundwater and coastal water, the Central Pollution Control Board has directed municipal bodies across India not to discharge any untreated sewage into rivers and other water bodies. Taking note of its internal report that shows severe negligence on part of municipal bodies in managing solid waste, the central pollution watchdog has issued statutory notices to civic authorities of 184 cities\towns across the country asking them to pull up their socks or face action. The National Green Tribunal has told the state government there should be no effluent discharge into the Ganga after 27 October, 2015, said an industry representative who attended the hearing of the tribunal in New Delhi on a case filed against polluters of the river.